Autumn Haag, the University’s special collections librarian and archivist for research and collections, holds the title page of "Farewell Song of Frederick Douglass," composed by Julia Griffiths and contained within a volume of sheet music recently purchased at auction by the University of Rochester Department of Rare Books, Special Collections, and Preservation. The piece is believed to be the only one of its kind in the United States. In 1847 Frederick Douglass was getting ready to leave England where he had lived to avoid being recaptured after his escape from enslavement in Maryland. He had crisscrossed Britain for the last 19 months, lecturing on the evils of slavery in his native country. Now that supporters had raised 150 English pounds (about $750 then) to buy his legal freedom, he was able to return to his family in the United States. Yet, his safe passage was by no means guaranteed. To commemorate Douglass’s departure from Britain, his close companion and fellow abolitionist, the Englishwoman Julia Griffiths, wrote the “Farewell Song of Frederick Douglass.” Only two copies of the sheet music are known to exist—and one of them was acquired earlier this year by the University of Rochester’s Department of Rare Books, Special Collections, and Preservation. In early December, the song will be performed as part of this year’s celebrations to mark the bicentennial of the birth of the renowned publisher, orator, freedom fighter, and statesman. David Blight, the Class of 1954 Professor of American History at Yale University and the author of Frederick Douglass: Prophet of Freedom (Simon & Schuster, 2018) will deliver the keynote lecture as part of the event. In 1847 when Douglass first arrived in Rochester, he found a bustling city of 50,000. It was here that same year that he launched his abolitionist newspaper the North Star. “The paper was to be a proud black enterprise,” writes Blight in his new biography. It was also in Rochester that Douglass gave his most famous speech, “What to the Slave is the 4th of July,” at the majestic Corinthian Hall in 1852. “What Douglass crafted and delivered… was nothing less than the rhetorical masterpiece of American abolitionism,” writes Blight. 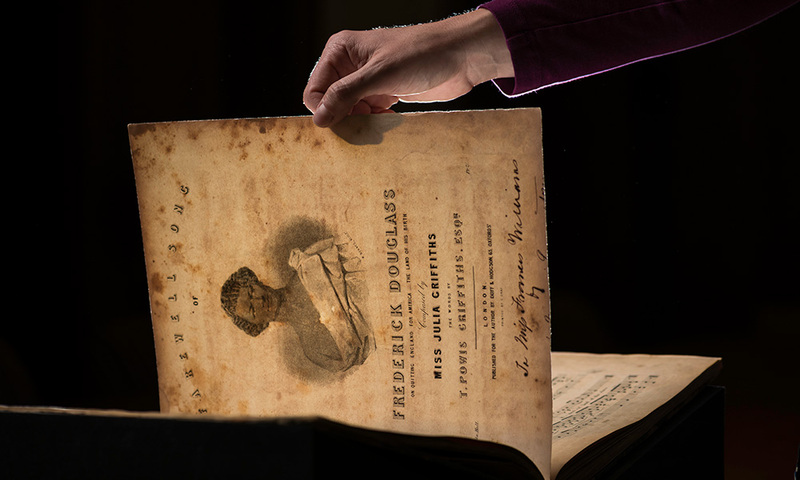 Over the last few decades, the University has assembled one of the world’s leading archival collections of rare Douglass materials, including letters, published speeches, Underground Railroad passes that had been used to smuggle slaves to safety, and other ephemera that document and expand upon Douglass’s history and activity. The collection is part of a larger repository of materials documenting the history of abolition and woman suffrage movements. The copy of Griffiths’s song now owned by the University is tucked inside a well-worn, black cloth book including 16 bound pieces of sheet music. Now referred to as the Francis A. Williams songbook, it bears the name of its former owner stamped in gold lettering on its cover. 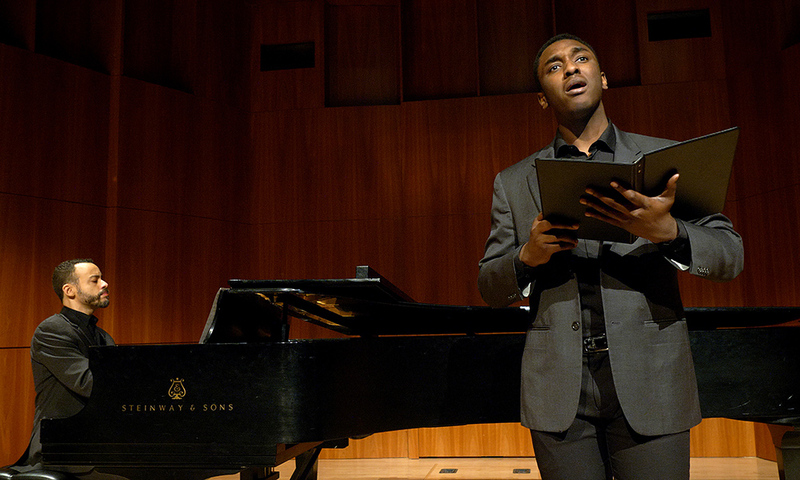 “Farewell Song of Frederick Douglass” is scored for voice and piano. Griffiths’s brother, the lawyer T. Powis Griffiths, penned the lyrics. 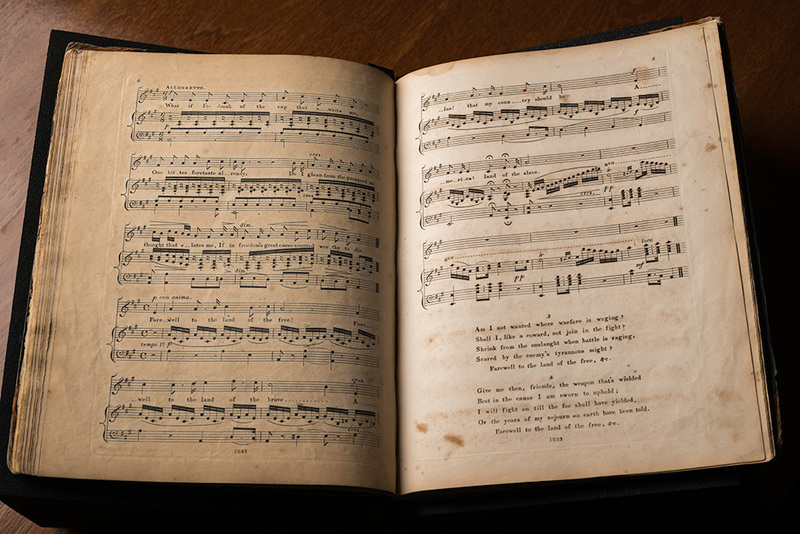 Having one’s own sheet music bound was not uncommon in the 19th century, says Autumn Haag, the University’s special collections librarian and archivist for research and collections. What makes this book so valuable is the rarity of the Douglass song. The only other known copy resides at the British Library in London. The Griffiths imagine the song from Douglass’s perspective, concluding that the abolitionist leader needs to return to America and join the fight against slavery, even if it could spell his death. “Shall I, like a coward, not join the fight? Shrink from the onslaught when battle is raging, Scared by the enemy’s tyrannous might? […] I will fight on till the foe shall have yielded, Or the years of my sojourn on earth have been told,” wrote lawyer Griffiths in Douglass’s imaginary voice. Haag says she is struck by the use of martial imagery and words like “warfare,” “battle,” and “weapon,” especially in the last two verses. “It feels like the lyrics are already foreshadowing the Civil War,” which was to break out 14 years later. Farewell to the land of the free! Farewell to the land of the brave. Alas! That my country should be America! Land of the slave. American soil shall be that which I tread. If in freedom’s great cause counted worthy to die. 3 Am I not wanted where warfare is waging? Shall I, like a coward, not join the fight? Scared by the enemy’s tyrannous might? Or the years of my sojourn on earth have been told. Farewell to the land of the free, etc. The book’s title page shows a stylized image of Douglass, wearing a classical-style toga artfully draped over his left shoulder, meant as an allusion to ancient Greece or Rome. The image, depicting Douglass with a stoic look, sharp jawline, and a bit of a Roman nose, is not a true representation of the man, says Haag. Was it propaganda? she muses. “Propaganda has sometimes negative connotations, but yes. It was written for a purpose.” It was written to remind Douglass’s supporters in England what he was returning home to, and to highlight to abolitionists in the United States the essential difference between the two countries at the time, says Haag. 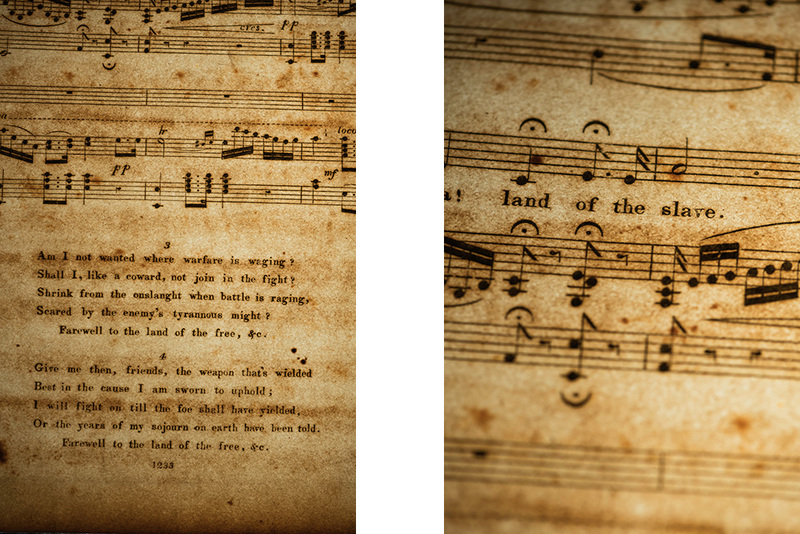 How did the rare sheet music end up in America? Haag has worked to piece together how the book ended up on this side of the Atlantic. In the back of the bound volume, she discovered a newspaper clipping of music, cut out from a Cincinnati newspaper—enough for Haag to start a genealogical search for its previous owner, a Francis A. Williams in Ohio. Soon she discovered that Williams was biracial, and one of the first women to graduate from Oberlin College, where she had studied music. She married a Peter H. Clark, one of Ohio’s most effective black abolitionist writers and speakers. At this point, the songbook’s provenance and the song’s subject begin to intertwine: in 1853 Douglass appointed Clark secretary of the National Convention of Colored Men. Three years later, the Clarks moved to Rochester and took up residence in the Douglass home with their infant daughter, while Clark worked as an assistant on the Frederick Douglass’ Paper (formerly the North Star). Barely a year later, the young family moved back to Cincinnati where Clark found other employment. Renowned Yale University historian David Blight, author of the new biography Frederick Douglass: Prophet of Freedom, will be the speaker. The event, cosponsored by RIT, is free and open to the public. 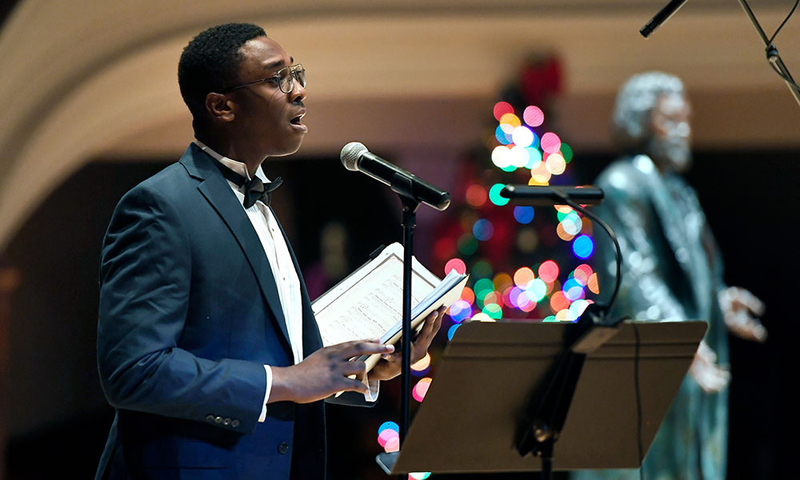 It features special musical performances by Eastman School of Music students, including a rendition of the “Farewell Song of Frederick Douglass,” a rare piece of sheet music that was recently acquired by the University of Rochester and hasn’t been performed in over a century. The song will be performed live on December 3 at 7 pm at the Hochstein Performance Hall in coproduction with Rochester Institute of Technology as part of the festivities honoring Douglass’s bicentennial. The event, titled Prophet of Freedom: Honoring Frederick Douglass in Word and Song, will include a lecture with renowned Yale historian Blight. Incidentally, it was her relationship with Douglass that caused a scandal in Rochester and well beyond. Griffiths, a white Englishwoman, had followed Douglass—a married man with five children—to America in 1849 to become his confidante, business manager, fundraiser, and assistant editor of the North Star. Seven years his senior, she even lived for a while in the Douglass household, together with her sister Eliza. Rumors circulated that their relationship had become intimate. At one point, Douglass and the Griffiths sisters were attacked in Battery Park at the lower tip of Manhattan, with one attacker’s hitting Douglass in the face. Blight isn’t sure of the rumors’ veracity. Fast forward to today: the Douglass lecture on December 3 will take place in the same venue as his funeral in 1895 (Hochstein Hall was then Central Presbyterian Church). That’s also the same date on which Douglass published the first edition of the North Star with coeditor M.R. Delaney in 1847. In time, the publication would become the most influential black, antislavery paper of the antebellum period.